1. How did the project come about? 2. What made this project special? What makes it special is that it beautifully exploits the creative potential of these technologies, which give access to playing instrumental music to pupils with physical disabilities and limited movement. But the work moves beyond just enabling the pupils to play in an inclusive ensemble, towards embracing the wide sonic and improvisational possibilities of the technology. Like the Soundbeam for example – an ultrasonic movement sensor – with a small hand or foot movement it can blare out a whole brass section by itself. It’s amazing what you can do with an iPad with the Thumbjam app – when swiped or strummed it can produce a shimmering cascade of sound, or switches that can be triggered by a gentle touch including the squeezable Skoog. Fit all of these into a score and it means that pupils with significant additional support needs can play alongside their peers on an equal footing. We also use the very accessible Figurenotes notation which means even pupils with learning difficulties and autism can learn to read music and play conventional instruments. 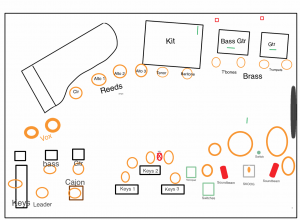 (See sketch for stage plan with instrumentation attached). 3. What other projects do you have on the go at the moment? Since Wagner’s School of Cool was such as success, we have commissioned Lewis again for this year and we’re currently rehearsing ‘Jazz Jigsaw’ – again with ESJO – which will be performed at the Queen’s Hall Edinburgh on 15th March. We’ve also been successful in a bid to PRS for Music Foundation funds to commission Scottish composer Sonia Allori to work on a new piece ‘Lost & Found’ based on experiences of people who like her have had a stroke, and in some cases lost – and regained – the capacity for speech. She will be working with the Strokeness group which is based near her in the Highlands. We are preparing for the Easter course of our flagship ensemble the Digital Orchestra who devise their own new music – this time collaborating with electro-acoustic violinist Ian Peaston. The Digital Orchestra are also going to be working with NYOS and Oliver Searle later in the year. As usual we’re working on a variety of creative projects in special schools in partnership with local authorities around the country and plans to celebrate our 20th anniversary next year. 4. Who are the upcoming Scottish composers to watch? Of course as you might expect the composers we would mention as ones to watch are disabled composers such as Sonia Allori, Clare Johnston, Amble Skuse, Kris Halpin (who works with Drake Music in England) – and would love to hear from any others. 5. What is the project that you would most like to do? The Dream Project…? We are already working with Sir James MacMillan as part of his Cumnock Tryst festival with pupils from a special school in Cumnock working regularly with Matilda Brown to create new work each year, which is amazing and we hope this relationship will continue. We would love to do something more in the rock/pop/electronica area with the Digital Orchestra that would push the limits of what they can do using their digital devices – maybe triggering some fantastic visual effects at the same time? The possibilities are endless – we’re open to ideas.